After the success of Ingredient Chili, I was left with a hankering for spicy, but not too spicy. Don't get me wrong, I've gone toe-to-toe with Adam D. from Killswitch Engage in a contest to eat the world's hottest curry. My mother once put me forward to eat Texas' hottest habanero salsa as a boast to one of her friends. But, I wanted to dial it back a bit. My go-to ingredient when I want spice and flavour without the face-melting experience of Jamaican hot peppers or the staid fresh jalapeño, is the chipotle jalapeño. Some peppers have that smoky flavour naturally, but I'm a big fan of the smoky flavour that gets there using smoke. For this meal I had some extra canned chipotles from a previous meal and wanted a way to get them used up before they went bad. This recipe takes a cue from my Rushed Roast Chicken Breast, which I make due to the inexpensive cost of chicken breasts with the bone in and the recipe's ability to cook during my gymnasium time after work. This is a fairly-simple recipe. It's best to let the butter sit at room temperature for a bit to soften it up, much as the Thrifty Sifter tells me you need to do when baking. Place the chipotles, garlic cloves, and butter or margarine in a food processor and blend on pulse a few times. 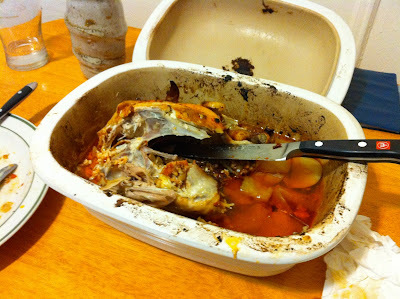 Put the whole chicken on a plate and loosen the skin from the body. I often tend to tear the skin over the breasts because I haven't practiced doing this enough, so be gentle. Once loosened, spread the chipotle-butter mixture under the skin all over the meat. Then spread the mixture over the skin and inside the chicken's body cavity. Cut the potatoes and onions into eighths and put in the bottom of a stoneware baker. There's a fancy French term for these I'm not remembering, so I'll keep calling it a baker until someone tells me otherwise. Cover the vegetables with the chicken stock, then place the chicken on top and cover. Place the baker in the oven and cook at 450 degrees F for an hour to an hour and a half. 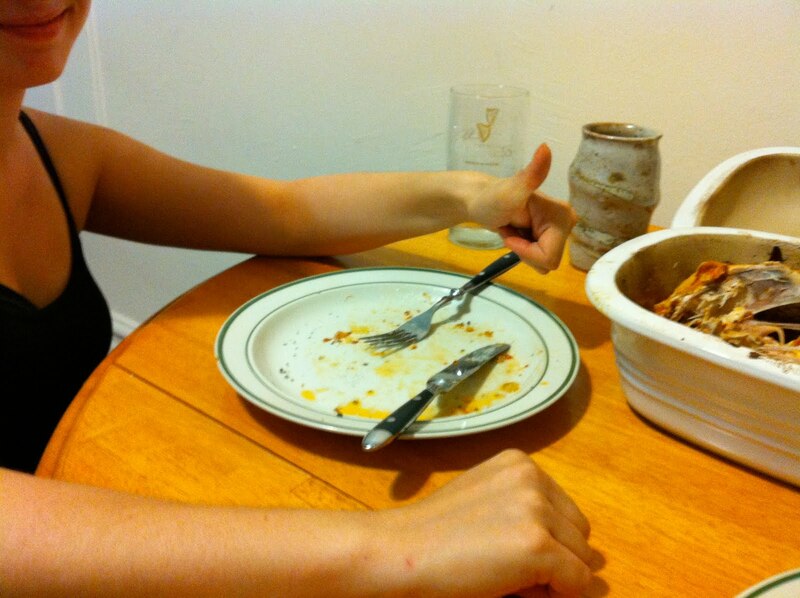 The Thrifty Sifter gave it a thumb's up and cleaned her plate. By the way, if you dig the vase in the background, it was created by the über-talented Rosemary Forrest of Forrest Pottery. I may be biased; her daughter is one of my closest friends. Dude, I have been wracking my brains trying to come up with the "fancy French term" to which you refer since I first read this post, and I believe I finally have it - cocotte? Yes? No...? Are you calling me a prostitute? But, yes, I think that was it! Should I be calling you a prostitute...?